Heavy snow during the winter of 1941 often kept pilots and their aircraft grounded, despite the best efforts of the ground crew. Spitfire 'G' George - based at RAF Manston and assigned to Flt. 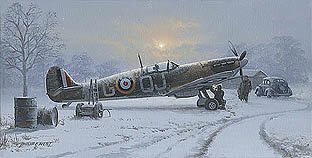 Lt. Geoffrey Wellum, could only resume combat sweeps over northern Europe once the storm had passed and they were all satisfied the aircraft was safe to fly.